Niagara Floral Clock - Just 1 1/2 miles (2.5 km) north of the Niagara Botanical Gardens lies another free treasure. The Floral clock is a huge working clock with a 'face' of flowers that is changed twice a year. 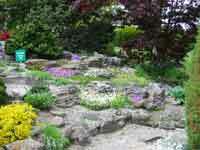 The surrounding grounds show off over 250 varieties of plants and 1200 different shrubs. There always seems to be so much colour and different things to look at it is easy to loose track of time. An important stop on the horticulturlists tour. In the spring the face of the clock blooms with violas and from the end of May and four cultivars of Alternanthera along with green and grey forms of Santolina Sage during the Summer and Fall. California Golden Privet and Blue Festuca Grass may be used for contrast. Living in a northern climate does restrict us a bit horticulturally. The clock was built in 1950 and measures 12.2 meters (40ft) in diameter. The floral face of the clock is changed twice a year. Lose yourself in 250 varieties of plants and 1200 variety of shrubs. The individual identifying signs are really useful when you find something you want to remember. If you are lucky enough to be here in late May, the Centennial Lilac Garden will be in full bloom. The air just smells so nice you wish you didn't have to go. With all the different bedding displays there is always something in bloom. 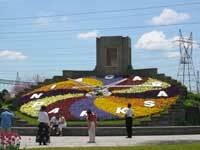 The floral clock and surrounding gardens are a wonderful stop when exploring Niagara. Location: 14004 Niagara Parkway, Queenston, Ont. Facilities: wheelchair accessible, washrooms, shopping, snackbar.